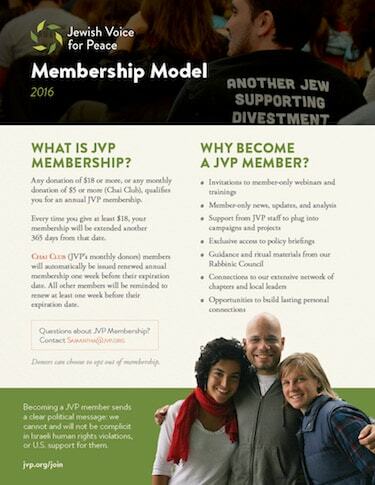 Help JVP recruit 4,000 New Members by the end of May! Set up your own Peer-to-Peer page to recruit your networks to become JVP members! And check your own membership status to make sure it’s up to date! Jewish Voice for Peace is a diverse and democratic community of activists inspired by Jewish tradition to work together for peace, social justice, and human rights. We are a grassroots organization, which means our members are our power. While pro-Occupation organizations may be working with enormous budgets, we at JVP have members across the country who are passionate about creating a just peace in Palestine-Israel, and we won’t stop until we have reached our goal. JVP started in a living room with a few individuals coming together in their grief and anger over Israel’s conduct and their determination to take action. Today all of our work has that same spark–of people finding power together to fight injustice–and it has spread to hundreds of thousands of living rooms and classrooms, synagogues and city halls, streets and computer screens from coast to coast. Put simply, our members are the heart and the engine of our work. Becoming a JVP member sends a clear political message: we cannot and will not ignore Israeli human rights violations, or US support for them. As long as these injustices are committed in our name, it is our obligation and opportunity to speak up and act out, to learn and to teach, to join others and build the movement for justice for all. Any annual donation of $18 or more, or any monthly donation of $5 or more (Chai Club), qualifies you for an annual JVP membership. JVP members endorse JVP’s mission and guiding principles. Note: donors can choose to opt out of membership. Every time you give at least $18, your membership will be extended another 365 days from that date. Chai Club members will automatically be issued renewed annual membership one week before their expiration date. All other members will be reminded to renew at least one week before their expiration date.